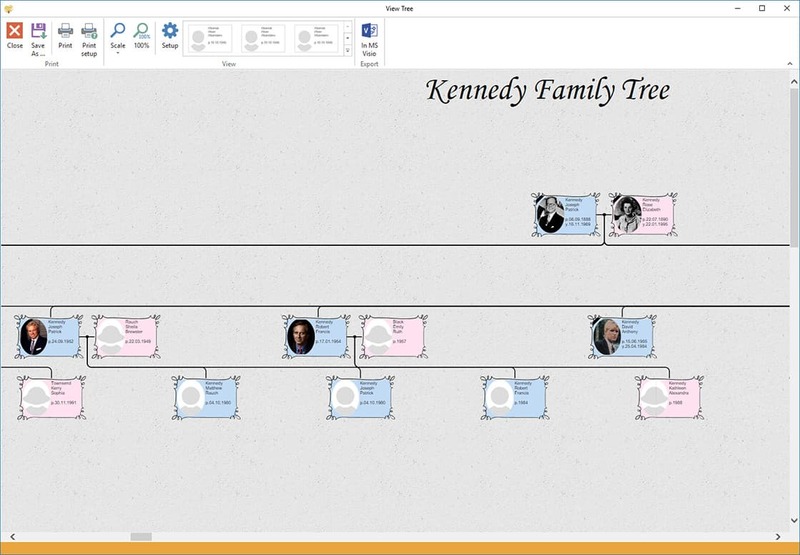 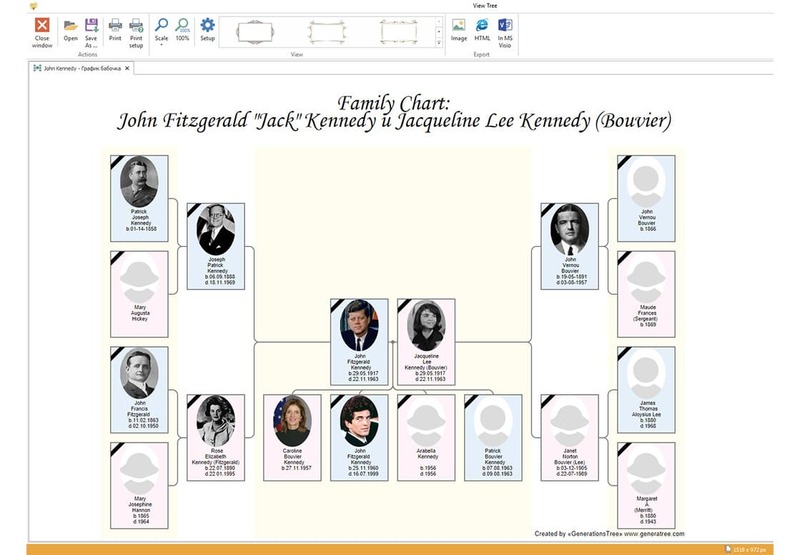 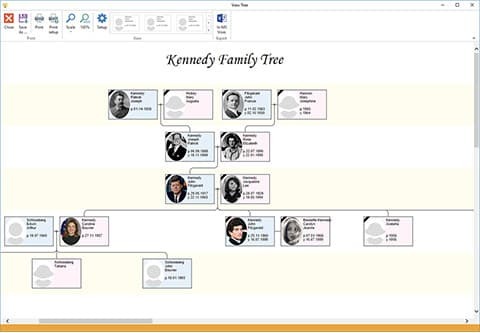 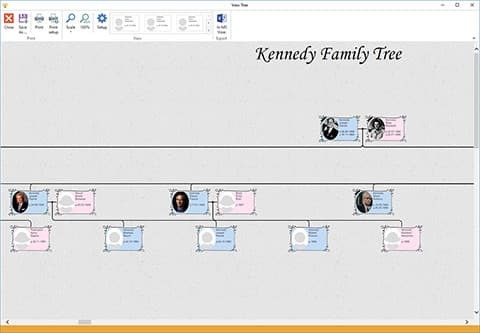 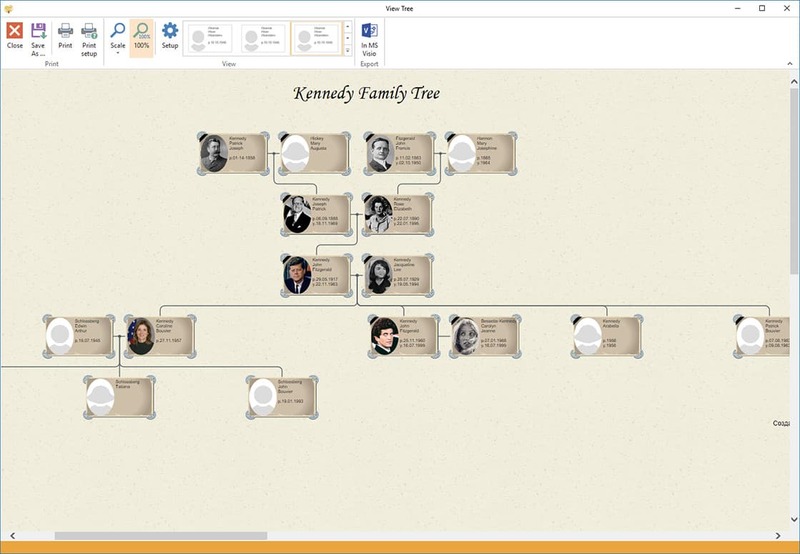 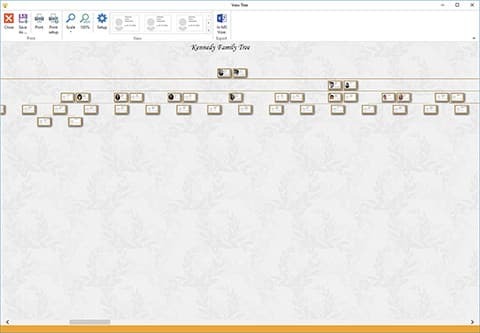 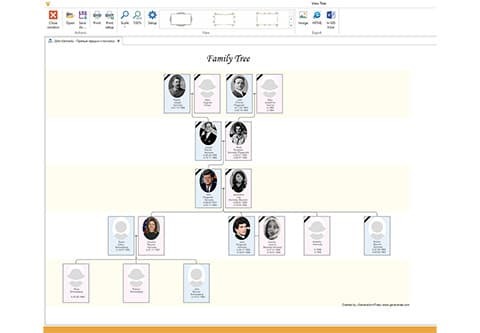 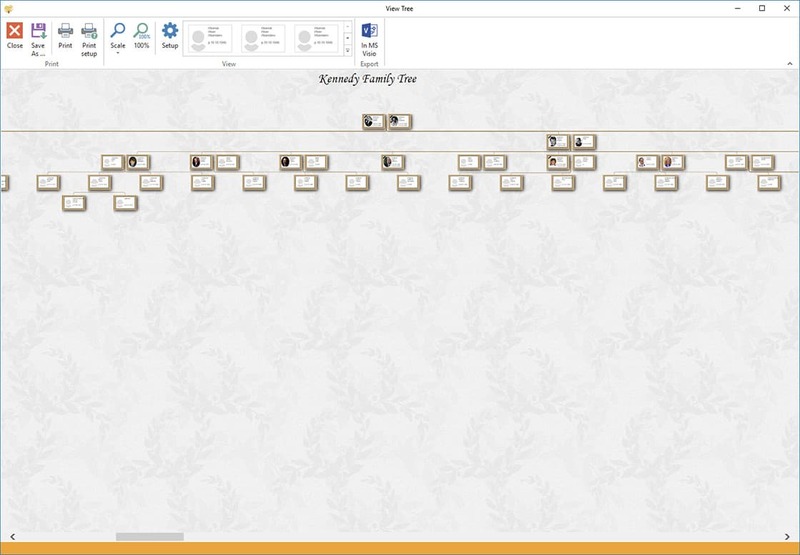 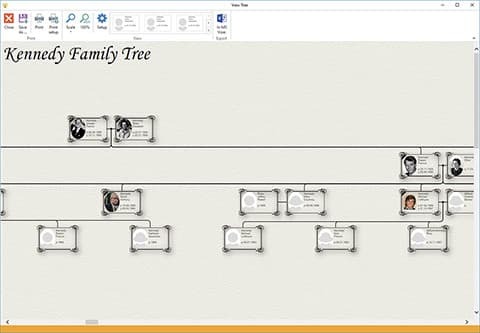 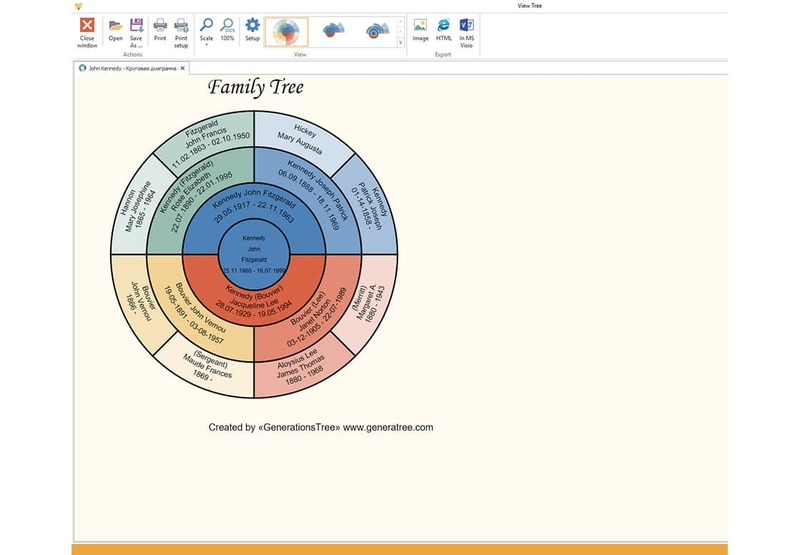 The Generations Tree software is designed to build a family tree (pedigree chart). 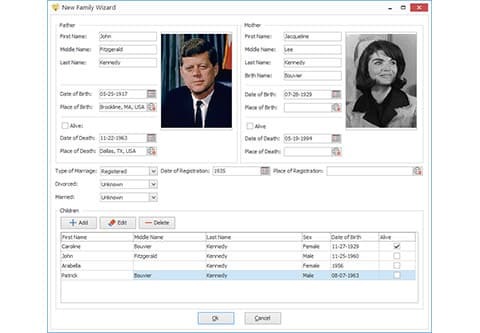 With its help, you can maintain a database of people, families and events in their lives, while attaching necessary documents. The program is easy to use and has rich features when setting up the interface. 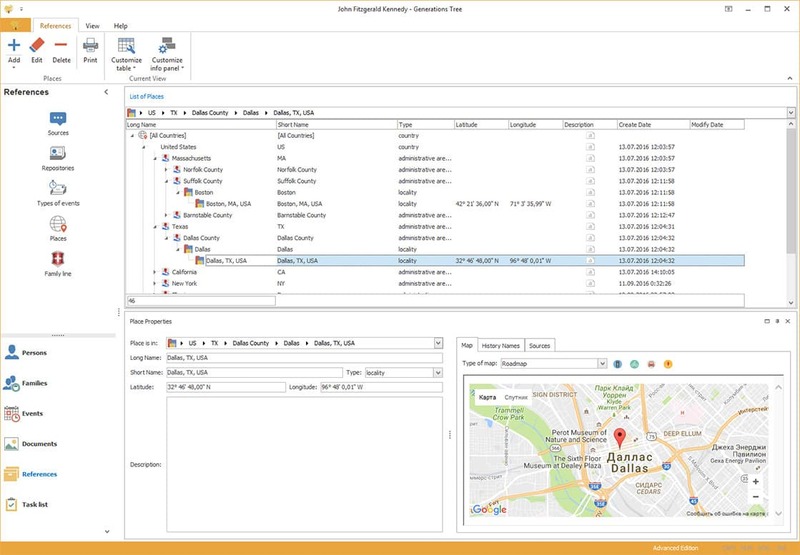 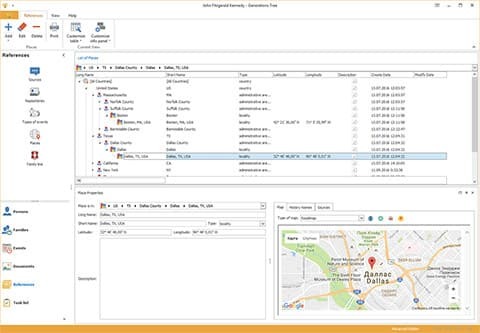 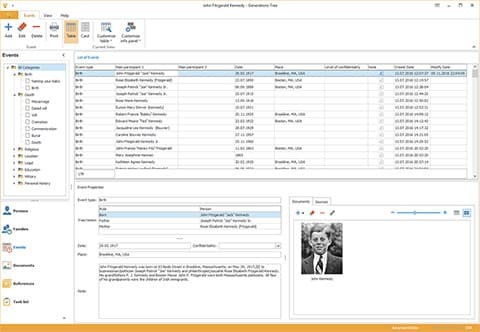 Information for each object can be displayed in a table view, card view, or tree view. 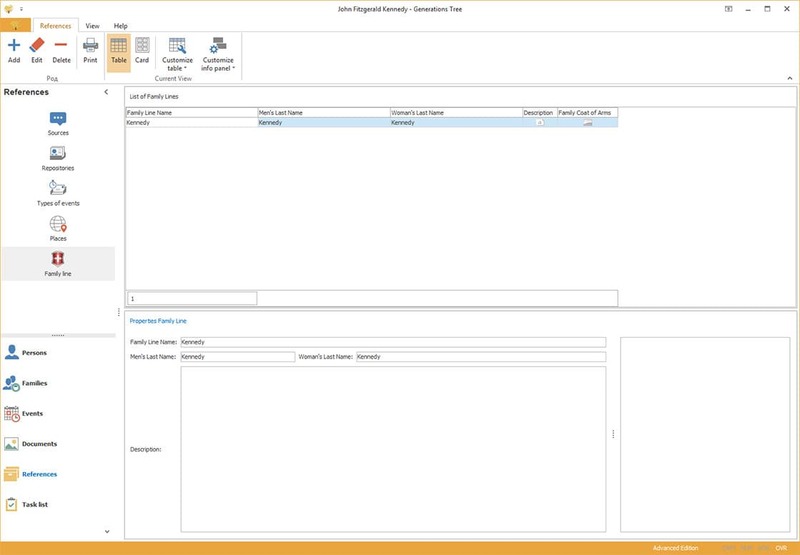 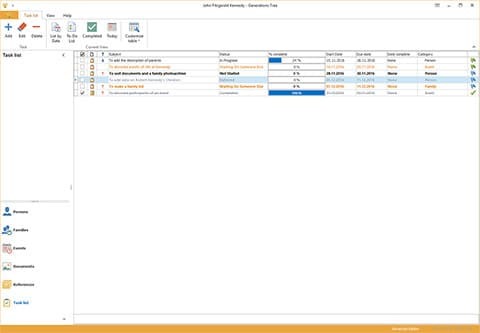 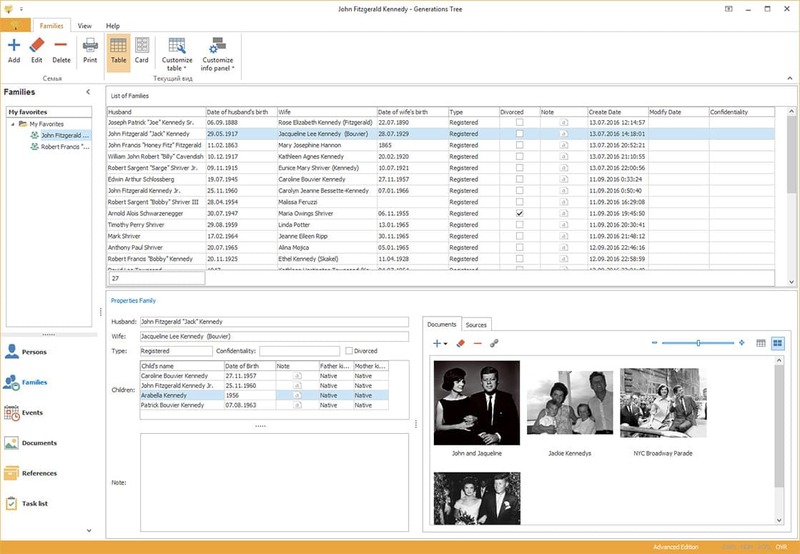 In a table view, you can filter, sort, group and customize the output columns. 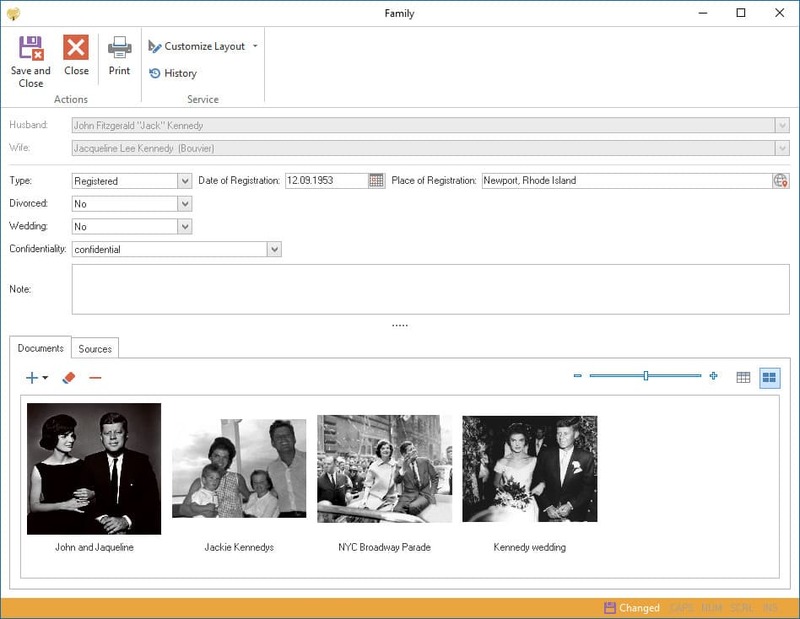 You can customize the layout of controls on the screen forms. 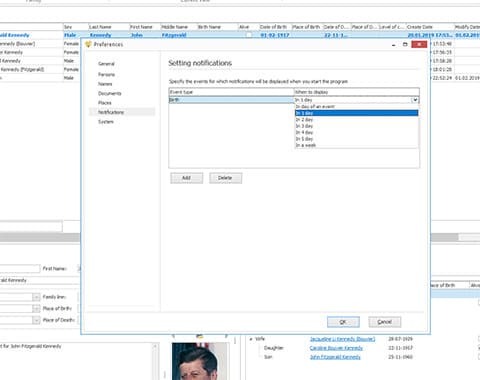 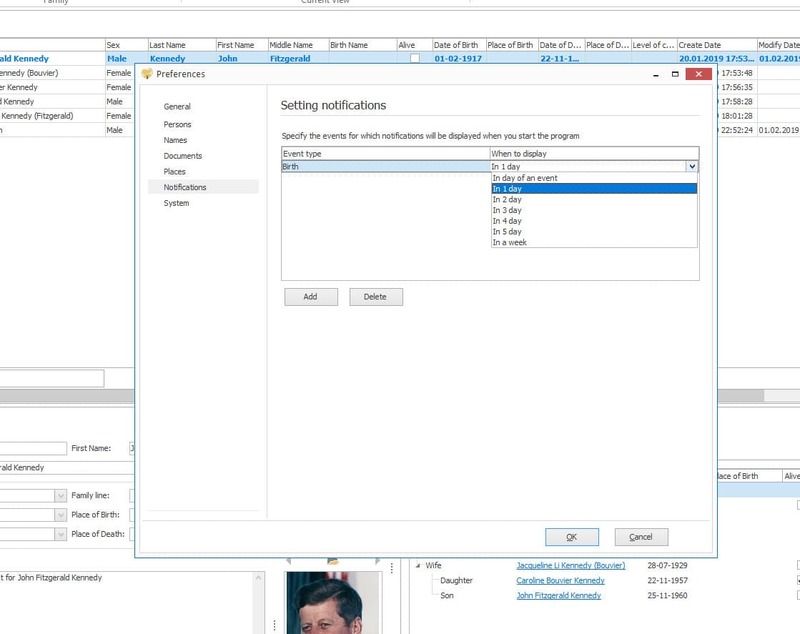 You can change the external appearance of the program using a large set of skins. 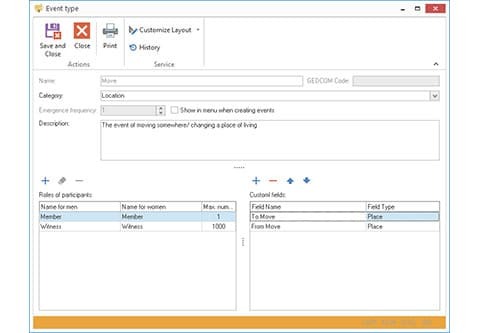 You can configure various options for displaying notifications that are displayed when the program starts with the ability to select the type of event and the time the notification is displayed regarding the start date of the event. One of the main features of the "Generations Tree" program is that it can construct a family tree (pedigree chart) for any chosen person. 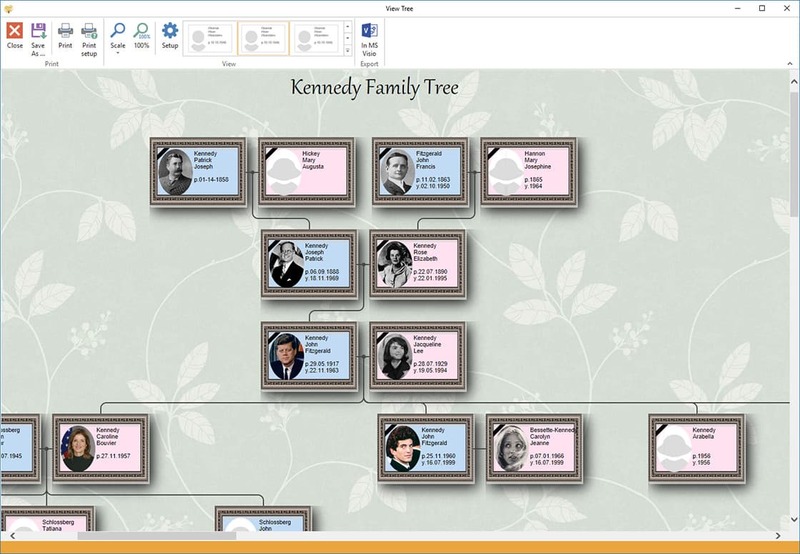 The program contains 65 standard family tree templates. 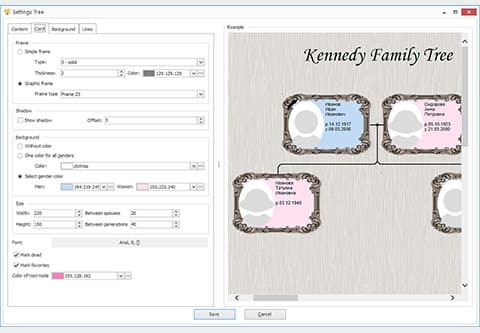 Users have many options to customize all parameters of the pedigree chart. 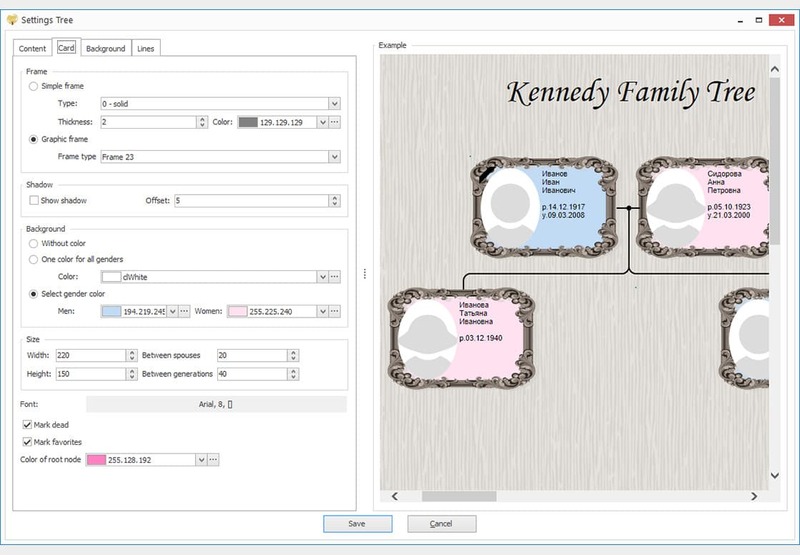 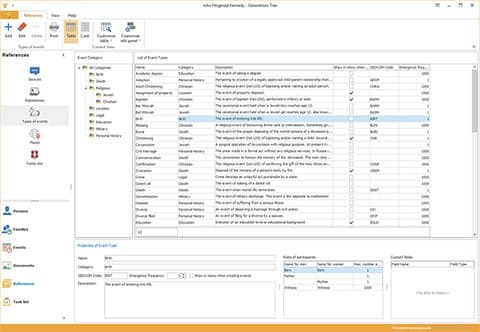 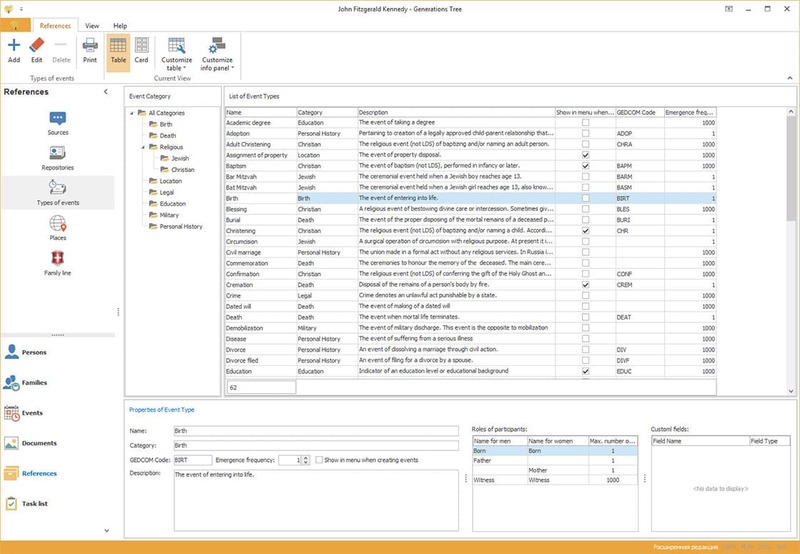 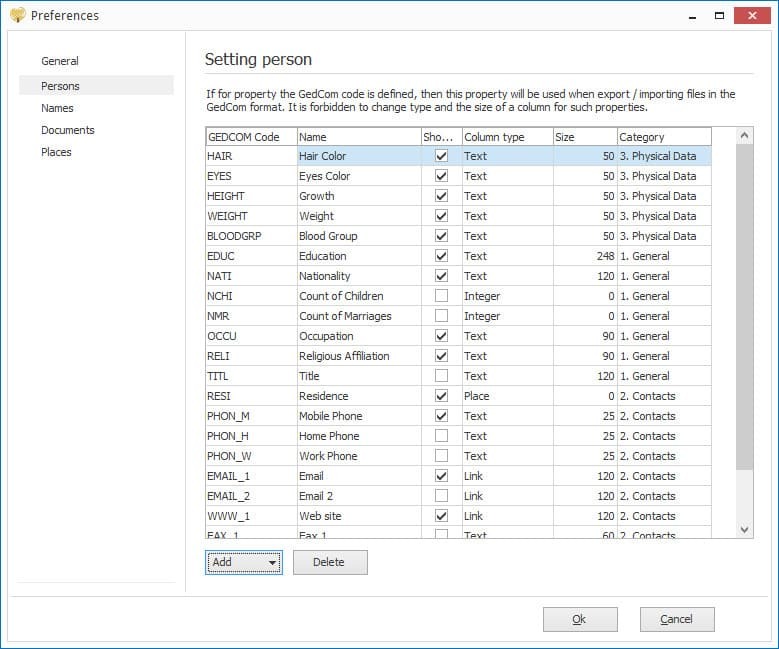 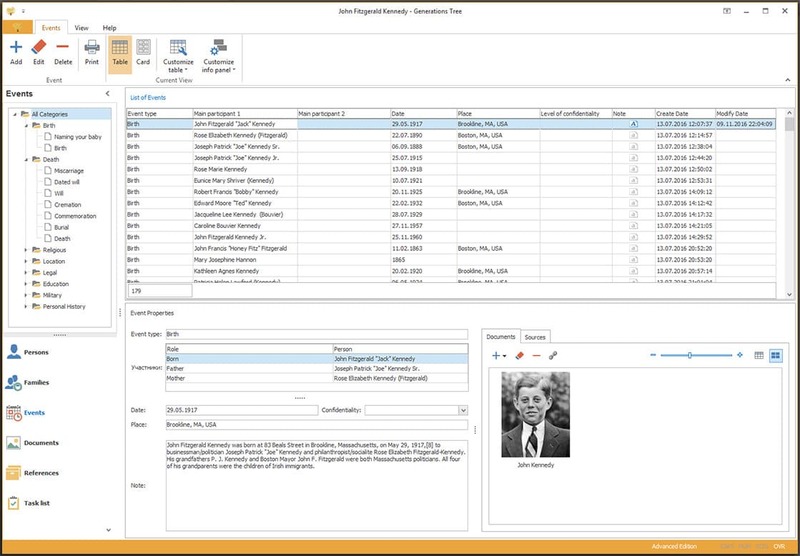 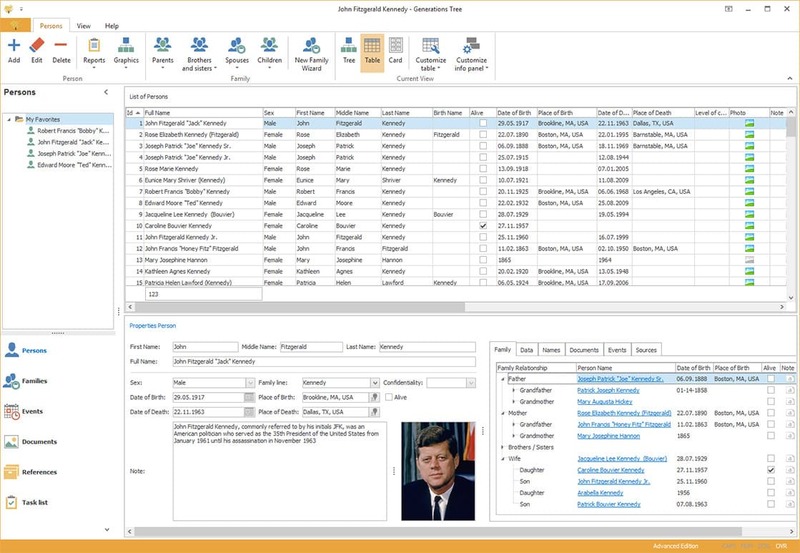 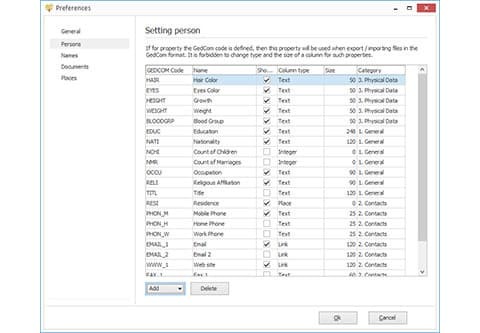 The Generations Tree software allows you to maintain a database of people. 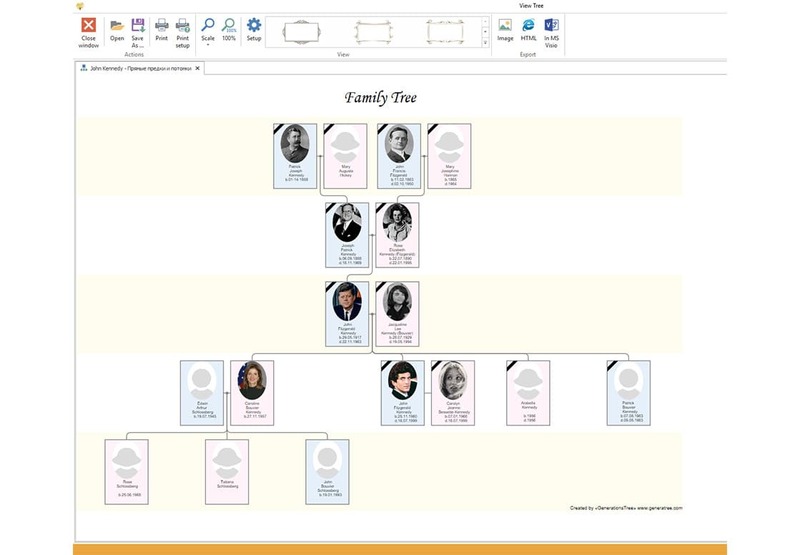 Based on information about a person, family ties can be built and a family tree (pedigree chart) formed. 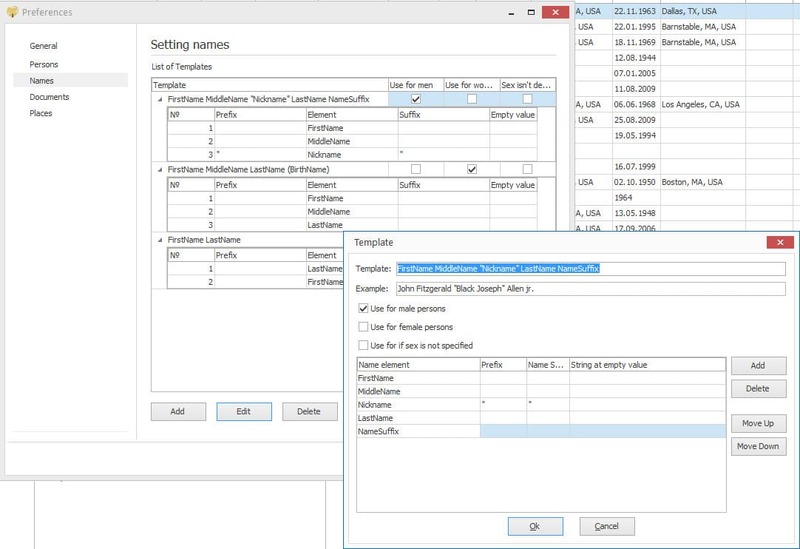 The program allows you to add new types of fields to describe a person. 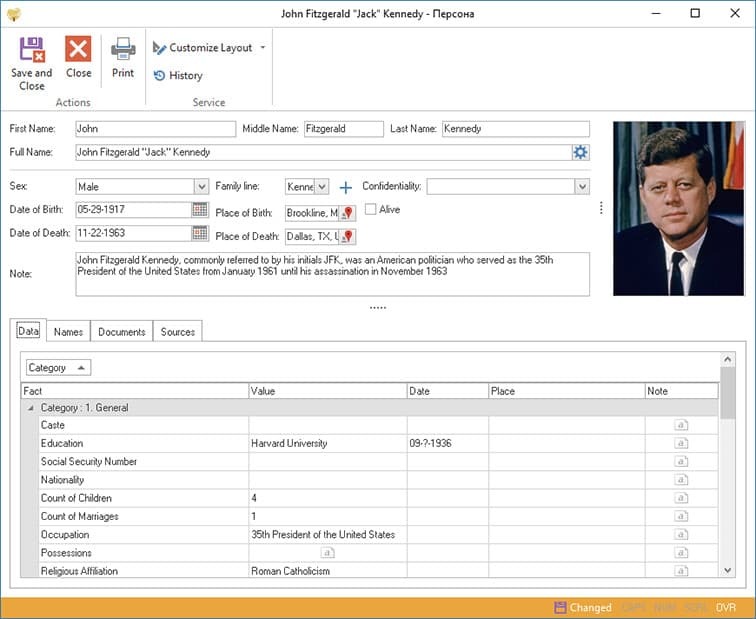 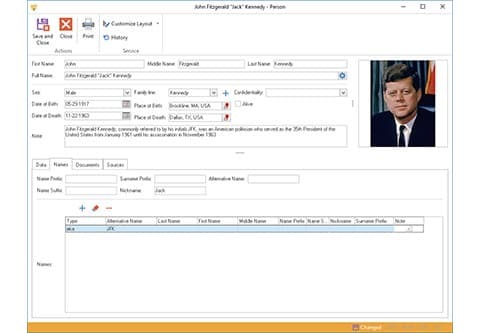 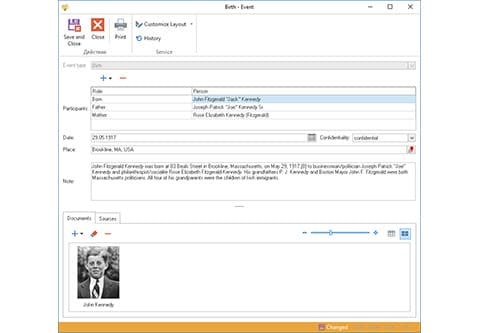 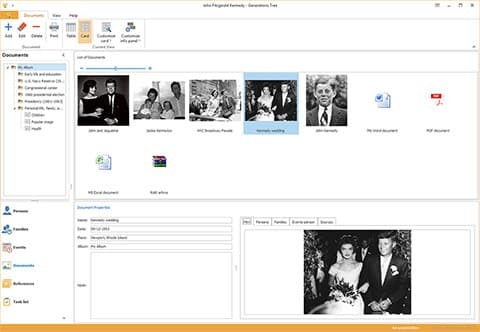 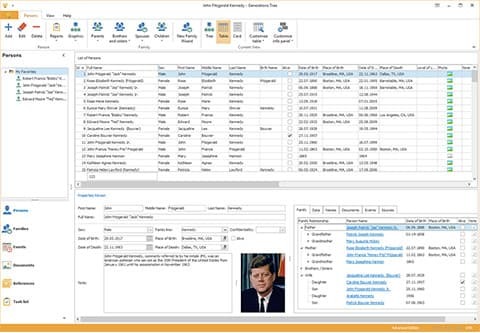 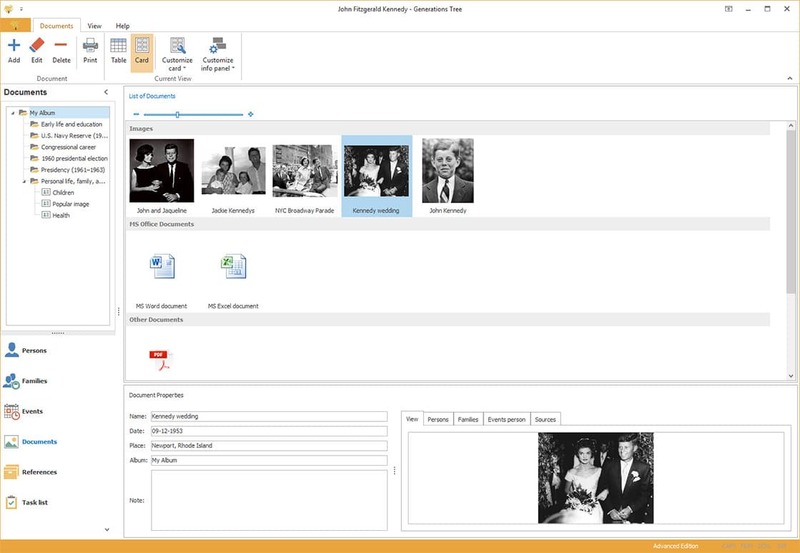 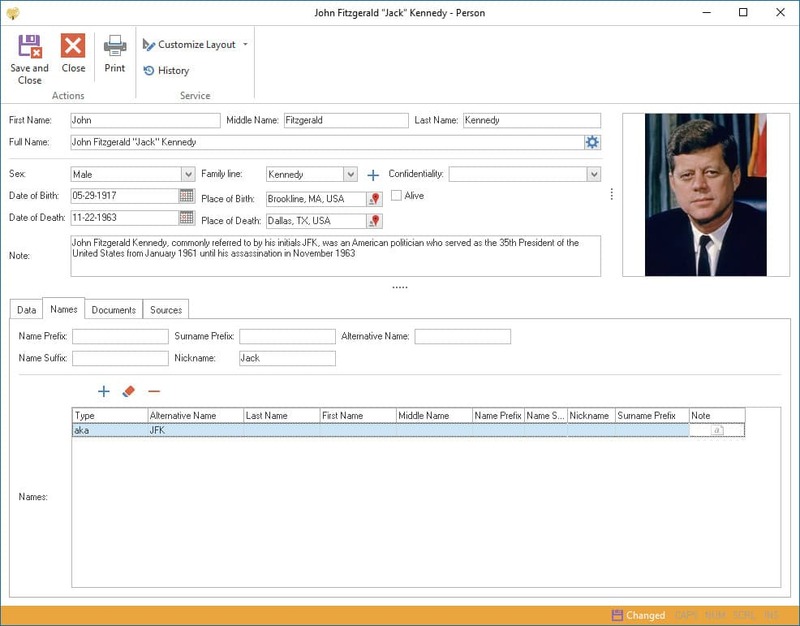 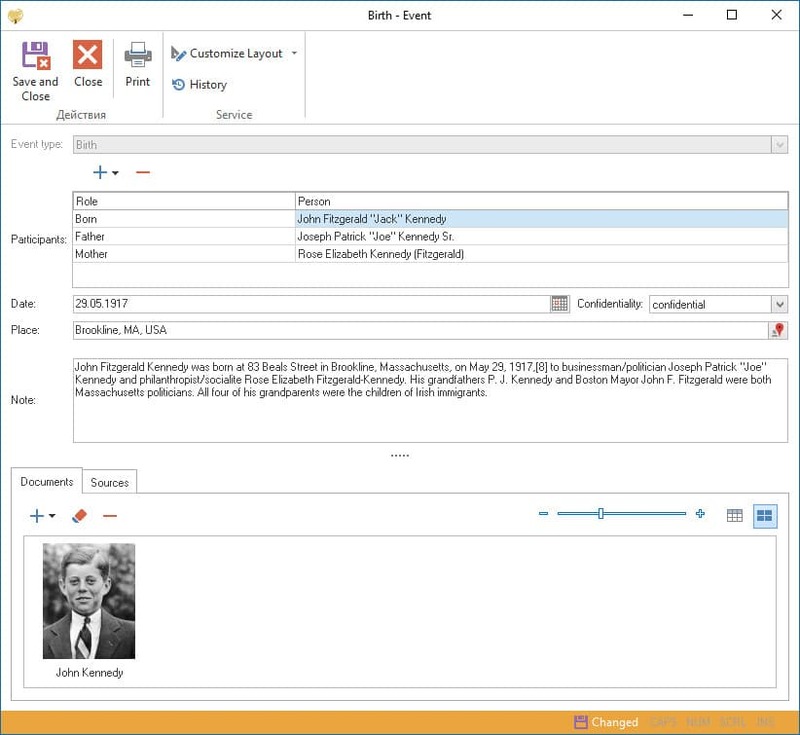 The Generations Tree software allows you to store documents of any type (images, audio, video, text, etc.). 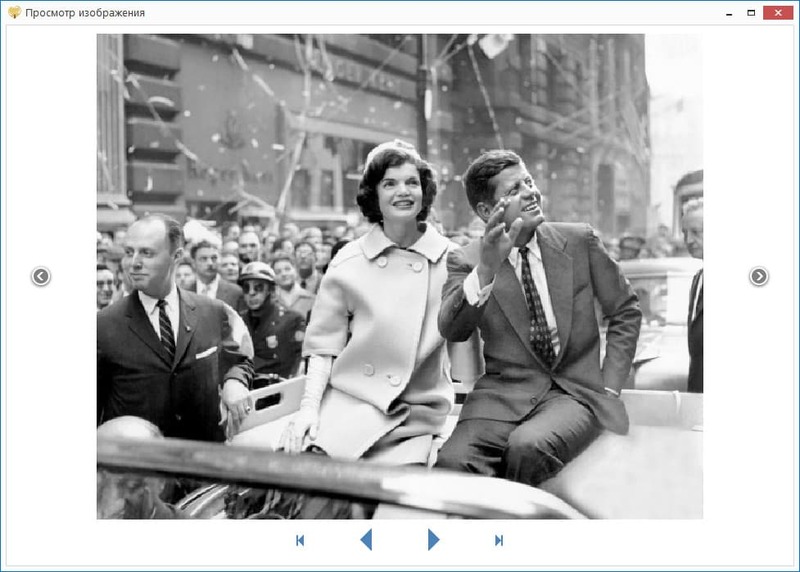 Images and documents can be combined into albums with a hierarchical structure. 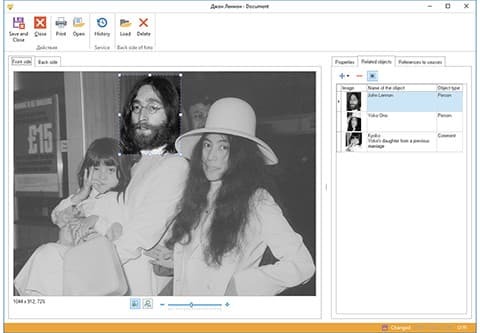 The user does this by himself. It is possible to select related objects in a photo - person, family, event, or a simple text comment. 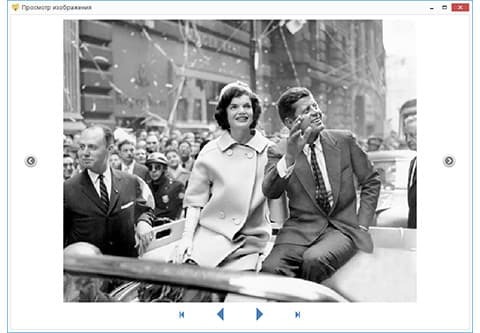 For photos it is possible to store the front and back side of the photo. 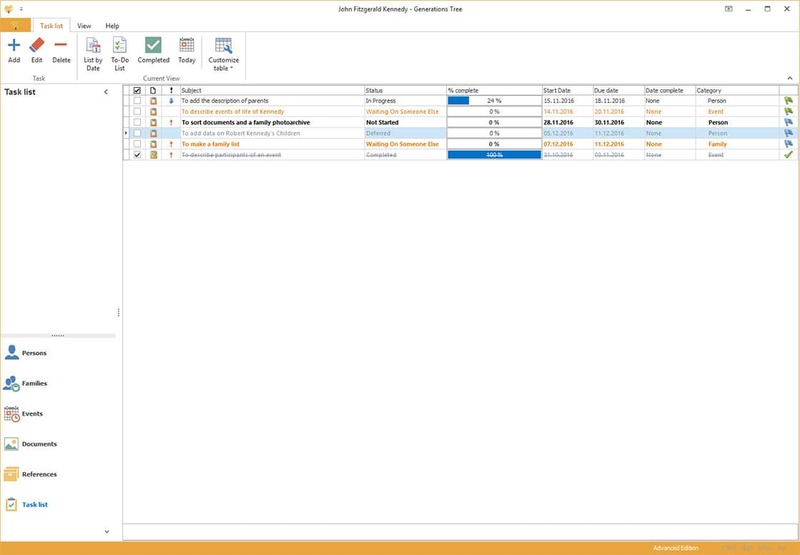 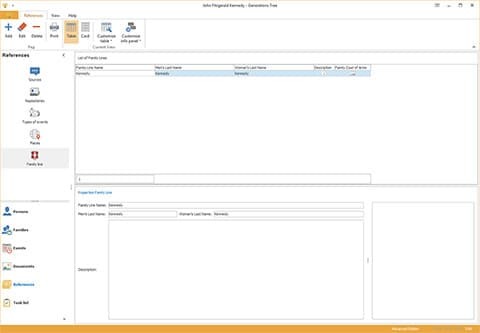 Documents can be displayed in preview mode or as a table. 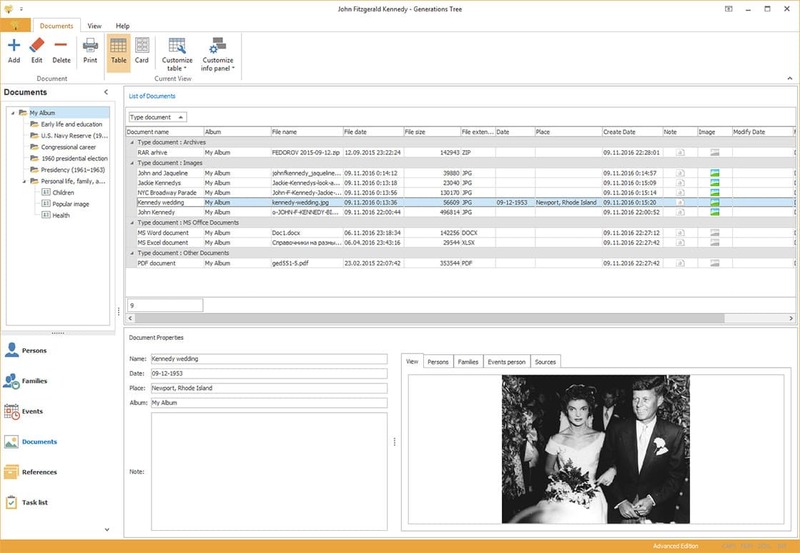 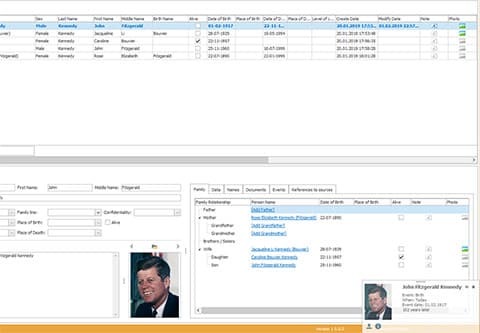 The Generations Tree software comes with rich features to manage events from a person's life. 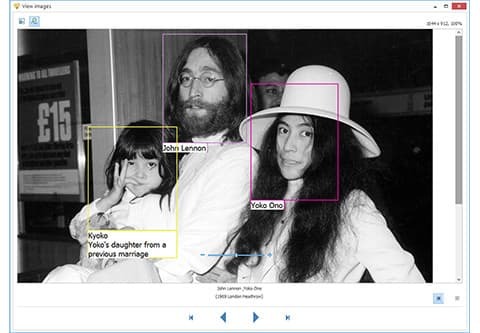 The description of events in a person's life allows you to form a detailed biography of an individual. The program includes about 65 standard types of events. 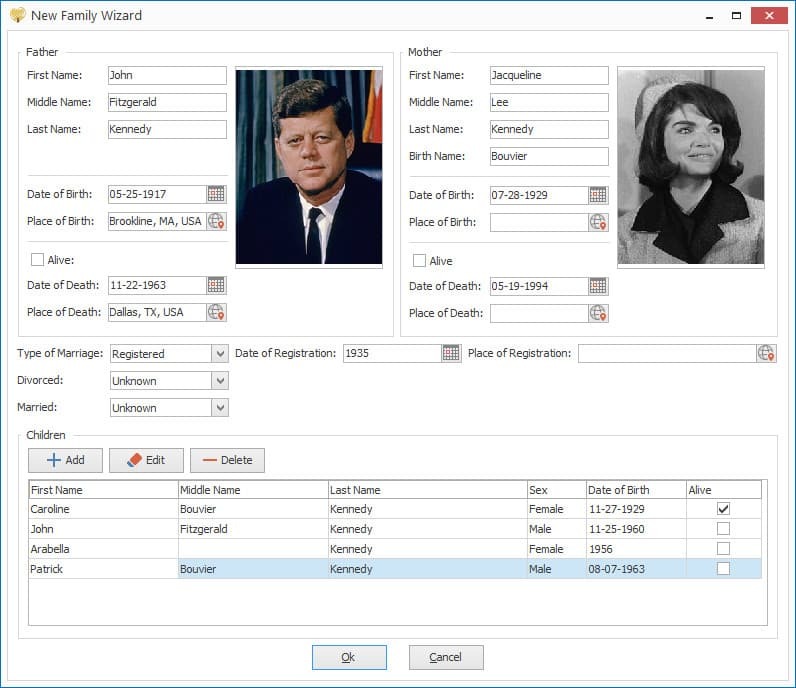 But users can also create new events. 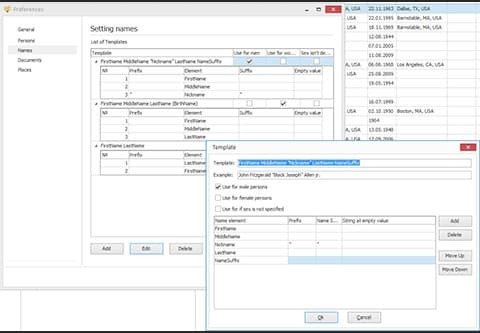 To do this, you need to specify the composition of participants, additional fields for description, frequency of occurrence of that event and category of the event. 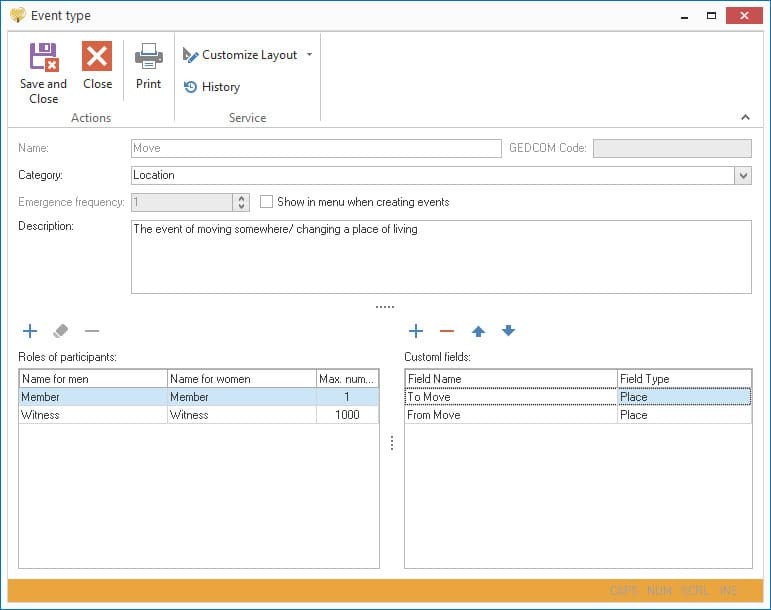 For filtering and searching convenience, all events in the program are categorized. The «Generation Tree» program allows you to create a family site based on the data that is entered into the program. Using the site, you can easily and conveniently share information with your relatives and friends. 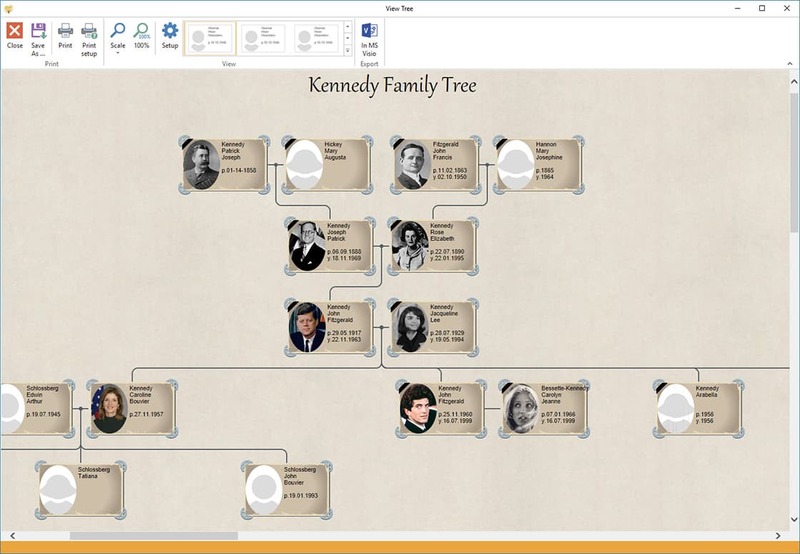 The main sections of the site are "Persons", "Families", "Events", "Photo Album", "Full Tree" and "Statistics". 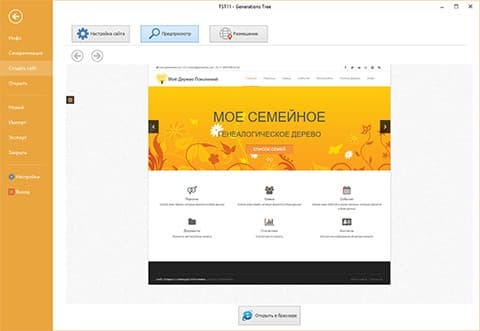 The program allows you to fine-tune the main page and all sections of the site. 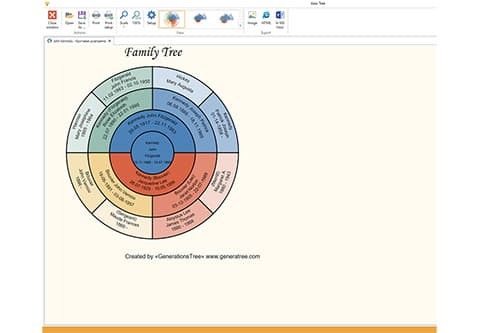 For each person there is an opportunity to form the following charts: ascending tree, descending tree, Butterfly chart and pie chart. The created program site allows you to host, send by email or copy to any folder on your hard drive.